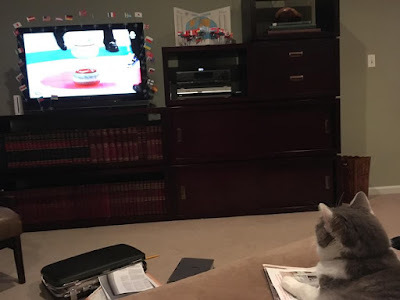 I was totally serious about River's watching the curling. No spoilers, please! I haven't updatd the medals standings yet because I still haven't watched this Pyeongchang Sunday morning's women's mass start in cross-country skiing, and I think I've finally figured out how to get a stream.nbcolympics.com browser with the full-event replay up without having to avert my eyes from a stray headline announcing the winner somewhere else on the page. The key is to get myself to the link where the live stream is going to play the night before; then, keep that tab open until the next morning, and NBC will have helpfully and magically turned that same page to the full replay by the time I wake up. TV, Internet and Sports have been so good to me for almost 50 years now. That brings up something I need to say--really to myself. I need to remember to go back and reread all of the HP stuff from a previous Olympics right before the next one ramps up, because I always end up forgetting all of these tricks in the two-year interims and then not refiguring them all out until the Olympics are almost over again. That brings up something else I want to say, which is that, of all the major-renovation things that the big sports institutions of my life have done in the last 35 or 40 years, the shift from both Olympics being in the once-every-same-fourth-year cycle to the what we have now where we get one Olympics every two years ... this is the best. It's better than wild-card rounds, draft lotteries, free agency, instant replay in officiating, any of the league realignments or expansions, designated hitter ... any of them. Some of those, in fact, have been bad in my book. But this Olympics change was brilliant. "The weather could not be better," reports our Olympic Broadcasting Services announcers, and, indeed, the skies are clear and blue in the mountainy, sea-side scene. For as much of the Olympics I have watched, I am embarrassed to admit that I've actually seen very little of South Korea. I don't imagine that's NBC's or the OBS's fault; the availability of all of the medal competitions keeps me jumping platform to platform almost any time I can hear the announcers' voices going featurey. This, too, is another thing I need to contemplate before the next Olympics. Dear Lord, please, that we would all get to the next Olympics happy and healthy and ready for fun. The OBS dudes expect this to be a good day for the Norwegians. #HotTake: I love the Finnish flag. #EvenHotterTake: I far prefer it to the Norwegian or Swedish flags. #WarmTake: I also like the Norwegian and Swedish flags a good bit. I am rooting for Team USA. There's Jessica Diggins, the official American flag-bearer for tonight's closing ceremonies. My personal flag-bearer is John Shuster, but I've got zero problem with the Jessica Diggins choice. I am proud for her to be carrying our flag. As Al Trautwig said at Sochi 2014, "Few things are more beautiful than a mass start in cross-country skiing." I still agree with Al. Half through the 30-kilometer race, the Norwegian superstar Marit Bjoergen (sp?) is about 40 seconds ahead of the field. Team USA's Diggins is eighth and about 20 seconds out of third. Marit Bjørgen more than doubles her lead over the race's back half, and comes across for her Winter Olympics-record 15th gold medal. Finland and Sweden take silver and bronze. Diggins finishes seventh. Long after the leaders, skiers from China and Belarus are the last to cross. They hug, and the OBS broadcasters imagine that the Chinese skier is inviting the Belarusian to Beijing 2022. That's a nice thought. We got started on the closing ceremonies tonight, but we're planning to do them in earnest on our own personal tape super delay when we're all more available. Will advise as events warrant.